Nutrients are rarely distributed homogenously in soil. 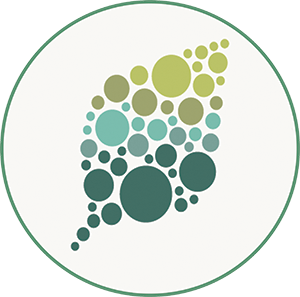 Consequently, plants have local and long-distance signaling systems in place to monitor and coordinate both demand and supply of essential macronutrients such as nitrogen (N). The “N-demand” long distance signal emanates from a section of the root system that may be facing N-deprivation, while the “N-supply” signal is activated if N has been found in the vicinity of the root. This allows the plant to adapt its root architecture and ensure optimal N supply by inducing the expression of hundreds of genes and increasing the number of lateral roots to forage for required nutrients (Kiba and Krapp, 2016). Interestingly, this long distance signal relay occurs systemically via the shoot. For example, xylem-mobile C-TERMINALLY ENCODED PEPTIDES produced in N-starved roots are components of the N-demand signaling pathway (Tabata et al., 2014); upon perception by their cognate receptors in shoots they can induce nitrate uptake transporters in distal roots. Similarly, once imported, nitrate initiates root-to=shoot signaling involving biosynthesis and movement of the plant growth hormone cytokinin (CK) from the site of production in the roots to the shoots where they control N assimilation. 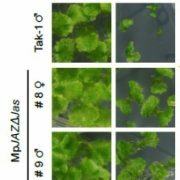 Therefore in heterogonous nitrate environments, nitrate-inducible IPT3 and IPT5 genes can affect overall plant development by controlling biosynthesis of different active forms of CK including trans-zeatin (Kieber and Schaller, 2014). New results from Poitout et al. (2018) further pushes CK to the center stage of the systemic control of nitrate uptake and metabolism. 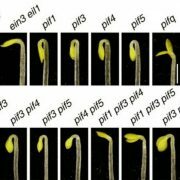 The authors used a hydroponic split root experimental system wherein Arabidopsis roots were partitioned into two compartments. These were set up in three combinations: both compartments containing the same media with nitrate (1 mM KNO3; N-supplied homogenously) or without nitrate (1 mM KCl; N-deprived homogenously), or with each of these media in a different compartment (N-supplied heterogeneously). 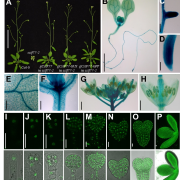 Under these conditions, the authors compared the patterns of CK accumulation and associated transcriptional responses of the roots and shoots of wild type (WT) plants to the CK biosynthetic and transport mutants ipt3,5,7 and abcg14, respectively. 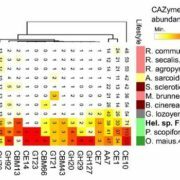 Importantly, impaired cytokinin biosynthesis and transport did not affect local nitrate perception. 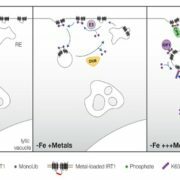 However unlike WT, both mutants failed to display a characteristic induction of “sentinel” genes such as NITRITE REDUCTASE1 that respond rapidly to long-distance N-supply signals. Furthermore, transcriptomic analyses revealed that genes regulated by heterogeneous nitrate provision in shoots of WT plants were enriched for genes involved in glutamate synthesis, the amino acid which N is first assimilated into (Forde and Lea, 2007). 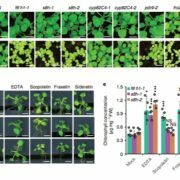 By contrast, neither mutant showed this transcriptional reprogramming, indicating that N assimilation pathways in shoots are CK dependent. In parallel, the authors measured the levels of all four isoprenoid CK forms and their derivatives to correlate the transcriptional changes with CK accumulation patterns in roots and shoots. Curiously in both mutants, only the reduced levels of trans-zeatin in shoots and not any of the other isoprenoid CK forms correlated with the dampened shoot transcriptional response. The authors concluded that shoot trans-zeatin controls downstream growth responses and further nitrate uptake and assimilation in response to heterogeneous nitrate availability. 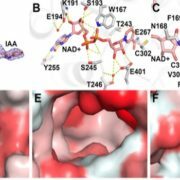 Findings described in this study, challenge existing theories on long-distance control of nitrogen uptake and form the basis of future work that will likely determine how cytokinin signaling networks are integrated with CEP signals associated with N foraging. Poitout, A., Crabos, A., Petřík, I., Novák, O., Krouk, G., Lacombe, B., and Ruffel, S. (2018). Responses to Systemic Nitrogen Signaling in Arabidopsis Roots Involve trans-Zeatin in Shoots. Plant Cell. https://doi.org/10.1105/tpc.18.00011. Forde, B.G., and Lea, P.J. (2007). 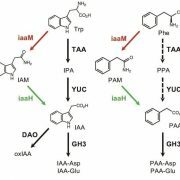 Glutamate in plants: metabolism, regulation, and signalling. J Exp Bot 58, 2339-2358. Kiba, T., and Krapp, A. (2016). Plant nitrogen acquisition under low availability: regulation of uptake and root architecture. Plant and Cell Physiology 57, 707-714. Kieber, J.J., and Schaller, G.E. (2014). Cytokinins. The Arabidopsis Book, e0168. Tabata, R., Sumida, K., Yoshii, T., Ohyama, K., Shinohara, H., and Matsubayashi, Y. (2014). Perception of root-derived peptides by shoot LRR-RKs mediates systemic N-demand signaling. Science 346, 343-346.